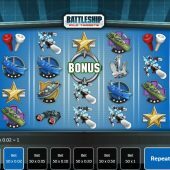 Battleship Wild Targets slot is a Hasbro licensed slot based on one of my favourite childhood games - Battleships. As you'll no doubt know, you have a 10x10 grid and place 1x5-square ship on it, 1x4-square 2x3 and 1x2 thus covering a total of 17 coordinates with your 5 ships. Your opponent calls say 'A-9' and you tell them 'hit or 'miss' and mark the miss with a white peg or a hit with a red. This leads me to the symbols, as one is indeed a pair of pegs from the original Hasbro game - that is of course unless you were posh and your parents could buy you the electronic version, no such luck in my house! We begin with a 5-reel game with 4 rows and 50 pay lines. Symbols are stacked and you get the sound of a sonar pulse upon each spin with a metallic tapping as each reel stops. The effects may remind you of Netent's Silent run slot which has a similar theme and certainly the sounds! Symbols appear stacked on the lower values only and your best pay is 5-of-a-kind aircraft carriers at 10x stake, down to the lowest red and white peg icon at 2x stake. There is an extra pay though which can be quite lucrative - should you land the matching ships on adjacent reels in the same row, they have bonus pays. So should you land 5 aircraft carrier green icons on the same row, you'd be awarded 500x bet. You need 5 as this ship occupies 5 coordinates in the Battleship game. If landing 4 cruiser icons on the same row which could be reels 2 to 5 or 1 to 4 as it occupies 4 coordinates, you are awarded 50x bet, for 3 adjacent submarines on a row 10x bet and lastly the small ship pays 2x bet adjacently on any row. There are mines though so beware! Actually, don't worry as on this slot they aren't dangerous, in fact they appear on reels 2 to 5 and when exploding they turn the whole reel Wild! There are simple bonus scatters on all reels and any 3, 4 or 5 triggers a very entertaining bonus free games round. When 3 or more scatters appear, you have a two part bonus game. Firstly you are presented with a 10x10 grid to place your 5 ships on, covering a total of 17 coordinates. You can let the game place them or use your mouse to position them yourself as if you were playing the real game at home. When you enter these coordinates and press 'play' a stream of red hot shelling cascades down the grid, passing over your ships. Any registering a hit will mark your ship red and award free spins on a scale on the right. 1-10 hits out of 17 awards that number of free games, 11 hits awards 12 up to the full 17 a huge 50 spins. You also get a small x bet win for any that were 'hit and destroyed! i.e. all their positions took a hit. You then return to the slot and will have a target on each reel you had a triggering scatter on. You choose which row to leave this on by moving it up or down and then commence the free games. Underneath you will see again your 5 ships and their total of 17 hole where the 'hit' pegs would go. The reels spin but there are no expanding Wilds this time, just singles on all reels. Each time a ship lands in one of your targets it registers a hit on the matching ship underneath the slot, so in order to sink say the carrier you would need the green carrier on the reels to land on 5 occasions inside your targets. Each ship destroyed awards 2 extra spins and then all its icons on the reels become Wilds. Should you destroy all 5 ships then the targets disappear and all ships on the reels will have become extra Wilds. You also get a bonus of 1000 coins!